I am ambiguous about seeing bears while hiking. 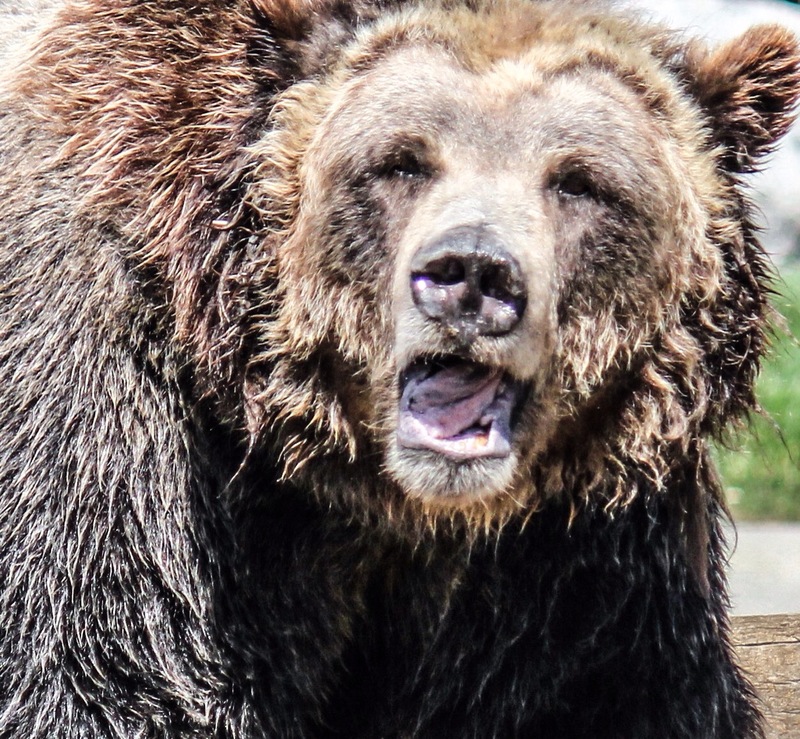 We’ve hiked in the national parks for eighteen years without bumping into a bear on a trail. Coming around the corner, finding a bear and calmly backing away with my arms slowly windmilling would make a great story. Except, I know me. I wouldn’t stay calm. When I calmly argue with my sons or husband they often ask, “Why are you yelling?” I’m just not the calm type. Nor could I play dead convincingly. Meeting a bear in the wild probably isn’t going to be something I’ll be good at. But bears roam at their discretion in Yellowstone. Good at it or not, a hiker might meet one. And we came to Yellowstone to hike, so this year, we decided to carry bear spray. We attended a bear-safety lecture which taught us to talk to the bear, windmill to look bigger and convinced us that we needed bear spray. It was $49.99. No, you can’t take it on a plane, so don’t look for a better price on Amazon. This is a Yellowstone-gift-shop-necessary purchase. “Turn your head,” I coaxed. She did! Most animals like to mosey around at sunrise and sunset. Not just bears, but moose, elk, bighorn sheep, mountain lions, mule deer and antelope. Both Hayden and Lamar Valley are reputed to be great wildlife viewing areas, so off we went at 5 am to try to catch some photos in Hayden Valley. 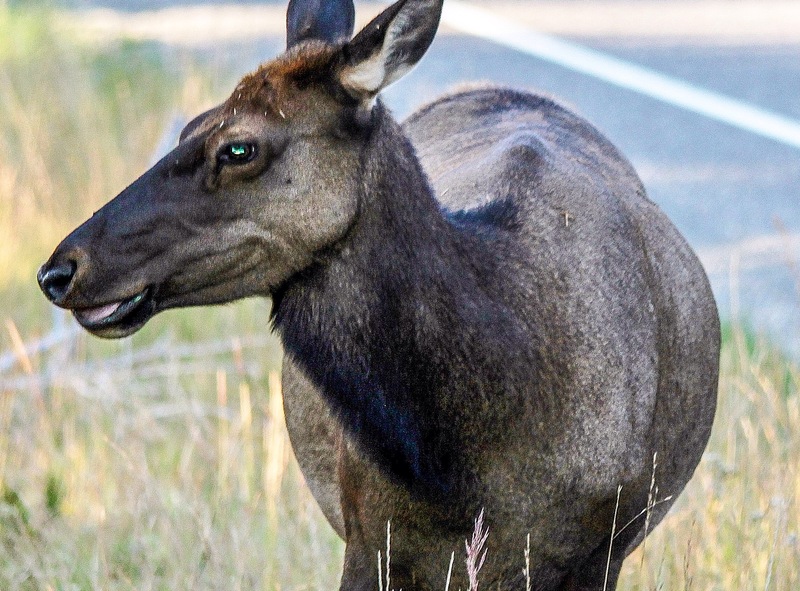 We traveled east to Yellowstone Lake and saw a female elk (cow) walking along the road, close as a hitchhiker. We stopped ahead of her. I got out of the car and the elk just looked at me while I raised my camera. The next elk was also a cow, thumbing it a mile further up the road. Shortly after, we looked over our shoulders as our car passed a bull elk spotted too late for us to stop. An hour went by. My eyes dried out from being peeled for wildlife. The boys got out their phones. We started looking for traffic pulled over instead, a sure sign that someone else has detected an animal. Entering Hayden Valley, we found what we were looking for: a van, a suburban and three rental cars parked on the shoulder! I hoist the eight-pound zoom lens I’d rented for $140. At the furthest point of zoom, the grizzly is still a brown smudge between two telephone poles. The spotter gets excited, shouting that the bear is, “on the move.” I snap a shot. I’ve got a photo of a brown blur in a forgettable field of grass. Ma-too-er? Juvenile? Is this even an eagle? The next shoulder-jam, we stop again. We look and see nothing through the lens. She’s midwestern but says ma-too-er. She tells me to snap a shot, so I do just to make her happy. 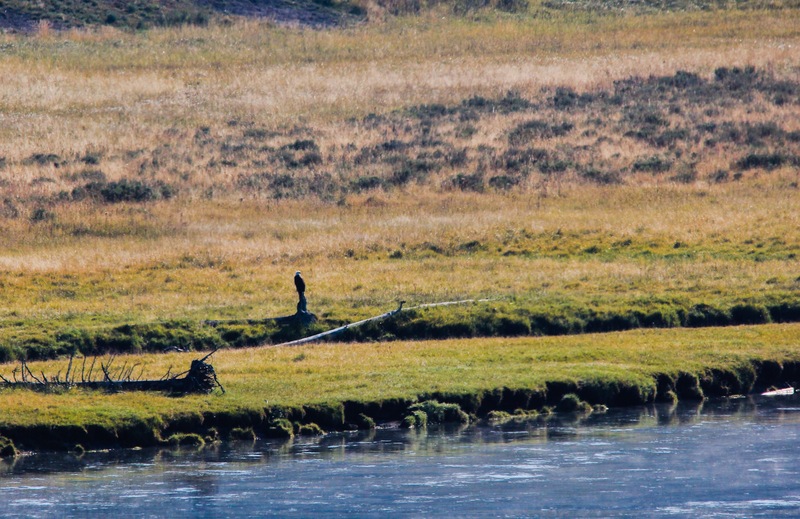 The next jam was the most common wildlife traffic snarl in Yellowstone: bison. Bison are huge and ubiquitous. Brad calls them rattalos because they are everywhere! A calf approached our car very directly. While I was composing a shot, I found out that bison are not as doped up as they look. A huge, male bull shrieked a bellow at the calf and shook its black tongue at me. Thought I was going to need bear spray. 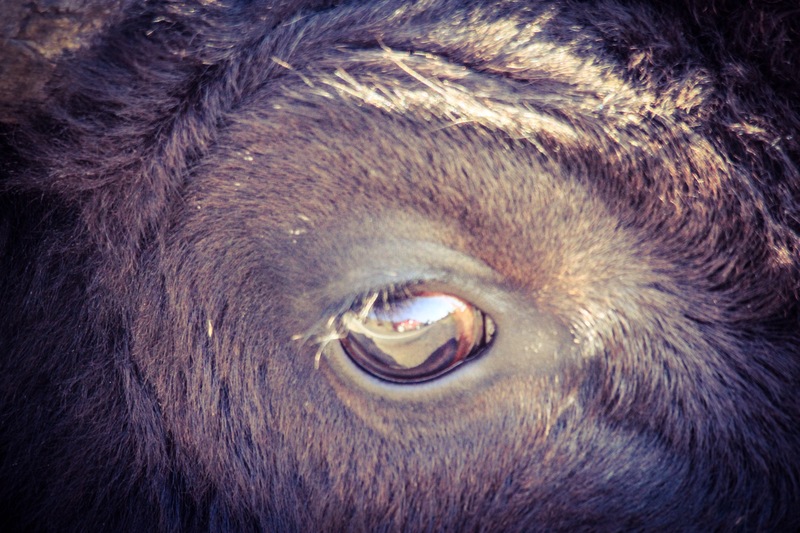 Bison shrieking so close its eyeball fills my viewfinder. Eleven hours later, we still had seen no bears other than that smudge in the field. No more elk, no moose, big horn sheep, mule deer or antelope. Other than bison, we saw chipmunks, squirrels, Canadian Geese and a vole, which is like a mole, only Northwestern. After eleven hours, we were beat. Honestly, as we headed back to Old Faithful Inn, it would have taken a big horn sheep riding a bear to get us to stop.